The Upper Table Rock provides a wonderful hiking trail to the top of this enormous flat rock. Spring time is the best to catch the best flower and endangered wildflower displays and to avoid the heat. The views are spectacular from the top. Here you can see the most of Sams Valley and Rogue Valley south to Ashland and Mt McLaughlin. 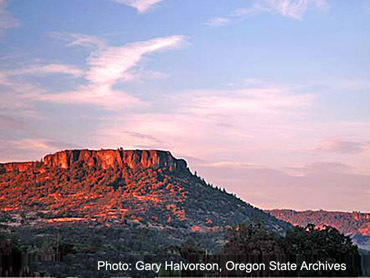 Hiking Upper Table Rock is a moderately easy 2.8-mile trip, with a 720 foot gain. At the 1.1-mile point there is a final steep pitch on the trail suddenly, then you reach the table's amazingly flat summit. Although easy for some to hike, we suggest you be in good health to hike it, especially in the summer. The Lower Table Rock trail is longer and rockier, climbing through shadier woods. The path climbs, steeply at times, after 1.6 miles the path suddenly crests at the plateau and becomes an old road. Walk another 200 yards up the road and fork left on a trail that ends at a 200-foot cliff & viewpoint. 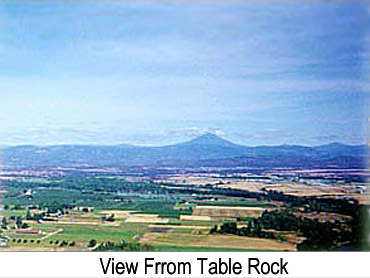 Lower Table Rock was dedicated as a nature preserve by The Nature Conservancy in 1979. 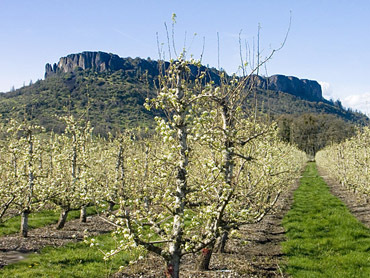 To find the Upper Table Rock trailhead from the Interstate 5, take Central Point Exit 33 (north of Medford), drive east on Biddle Road 1 mile, turn left on Table Rock Road for 5.2 miles to a curve, and turn right on Modoc Road for 1.5 miles to the trailhead parking lot on the left, just opposite of an electric substation. To find the Lower Table Rock trailhead from here, return 1.5 miles to Table Rock Road, turn right (away from Medford) to milepost 10, and then turn left on Wheeler Road 0.8 mile. History Info: In 1850 a gold strike at Jacksonville attracted so many miners and settlers to the Rogue Valley that the local Takelma Indians launched an attack in 1853 to reclaim their homeland. When the U.S. Army retaliated, the Takelmas retreated to Upper Table Rock, a natural fortress that defied capture. The Army sent a peace negotiator, Joe Lane. He agreed to grant the Indians a reservation that included the Table Rocks, and he also promised that the Army would build a fort nearby to protect the Indians from armed vigilantes. Because Joe Lane actually kept his word, he became a hero among both the whites and the Indians. An Oregon county was named after him, he was elected senator, and he was nominated for Vice President on a ticket that lost to Abraham Lincoln. Geology Info: The 125-foot-thick andesite rims capping these U-shaped mesas are remnants of a lava flow that snaked down the Rogue River Valley 9.6 million years ago from vents east of Prospect. Since then, erosion has worn away the softer surrounding rock, leaving the hard andesite perched 800 feet above the plain. Why are the mesas U-shaped? Geologists propose that the curves were originally horseshoe bends in the river channel where the lava flowed. Nearby Central Point is a wonderful recreation area for residents and visitors alike, offering easy access to skiing, boating, fishing, rafting, hiking, camping, biking and golfing and of course, Table Rock. Central Point is conveniently located within minutes of many cultural attractions such as the Oregon Shakespeare Festival, the Britt Music Festival, Rogue Community College's Outdoor Theater, plus numerous quality theater and musical events.